Practical, innovative and effective products which make cleaning chores easier are a definite must-have. SANITAS understands the needs and particularities of each and every household and offers effective and quick solutions with its NEW products, making house cleaning a piece of cake. The NEW cleaning products will make every surface shine and take care of your home as never before. 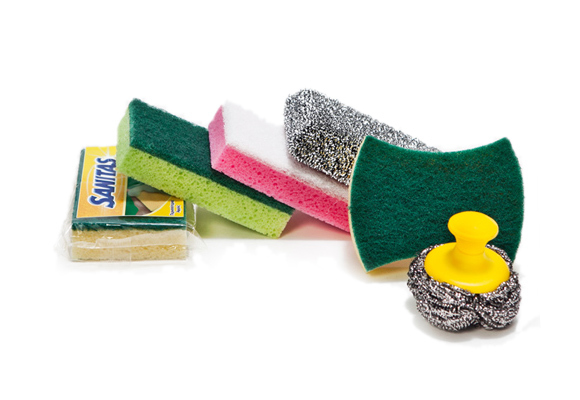 SANITAS scourers leave your cookware and surfaces shining clean. From the daily washing of your dishes and pots with tough stains, or other surfaces such as bathroom surfaces, ceramic hobs, even the walls of your house, you will definitely find a scourer that suits your needs. The range includes kitchen and bathroom, heavy duty, wool, microfibre scourers for use on ceramic hobs, and a magic scourer for use on walls. Made of high strength materials, these products provide fine results, making even the most tough stain disappear.